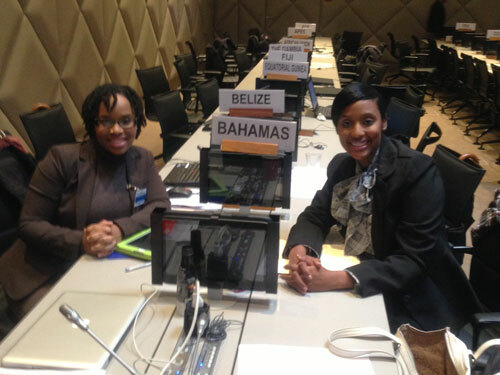 In December, 2012, Phylicia Woods, Financial and Trade Officer, Ministry of Financial Services and Donyelle Ward, 3rd Secretary, the Bahamas High Commission in London attended the 25th Geneva Week in Geneva, Switzerland. The representatives from The Bahamas participated in consultations on outstanding matters that will assist the Government of the Commonwealth of The Bahamas in its accession to the World Trade Organisation. Duty Free and Quota Free and Market Access, Preferential Rules of Origin, Intellectual Property, Agricultural Negotiations, and recent developments in WTO Jurisprudence were some of the matters discussed. Most notably, the representatives were able to attend the last General Council sitting for the year, which included representatives from the 157 member-countries as well as observer countries. At the General Council meeting, the representatives were able to learn first hand about the challenges in trade facilitations, opportunities that existed, and other issues from different regions in the area in trade. The economic opportunities available in trade were discussed at various levels. The call for substantial resources to address the increase of natural disasters, which result from climate changes and global warming, was one of the concerns raised by member countries. Additionally, representatives from The Bahamas expressed the need for technical assistance to develop and establish necessary trade infrastructure such as Sanitary and Phytosantiary laboratories and a Standards Bureau in The Bahamas. The deliverables were discussed in an effort to prepare for the MC9 (ministerial conference) scheduled to be held in Bali, Indonesia in December 2013. Members called for a level of transparency and inclusiveness to be maintained in preparation for the ministerial conference. Attendance at the 25th Geneva Week allowed for The Bahamas to further build the technical capacity to meet the requirements for accession to the World Trade Organisation. Additionally, The Bahamas was able to update the World Trade Organisation on various steps taken thus far to move closer to accession.